The headlines about the PlayStation Vita are often harsh these days, especially the headlines that deem the system is "almost D.O.A." That's a brutal assessment of a machine that's been out for only about four months in America and is very likely the most impressive piece of portable gaming technology ever sold. "I think, unfortunately, a lot of those stories were written before Vita even launched," John Koller, Sony's head of hardware marketing told me last week in Los Angeles. 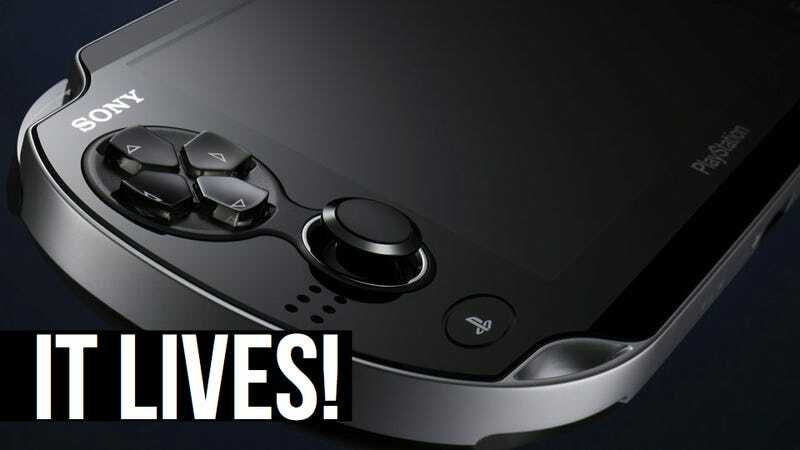 For those of you who think the Vita's already doomed; for those who are unimpressed with this Sony portable and its $40 games in this age of iPad gaming and $1 games, John Koller would like to present his best argument for why Vita's got a fine future ahead of it. "There's something I want to emphasize because I read a lot of those blog posts too..." Koller said. "Don't read the comments," I joked. Laughter. Then back on topic: "You get a lot of questions about 'Where is the content?'" Koller said. "We've seen that. And, first of all, there's a very strong back half coming in physical titles: the Street Fighters, the Maddens, the Assassin's Creeds, the Call of Dutys, PlayStation All-Stars, Sly, those are big games. But the digital side has far surpassed our expectations. It shows the type of consumer who has come into the market. It's a PS3 owner. Almost across the board, the Vita owner has been a PS3 owner." It's a PS3 owner, Koller said, who buys a physical game and then downloads a bunch more right to their Vita. Like the PSP before it, Koller says that the Vita currently "over-indexes" for an "urban" population, which translates, from marketing speak, to the fact that, in America, the Vita is exceptionally popular with black and Latino gamers who live in cities. The Vita is also almost entirely selling to PS3 owners, something Koller kept emphasizing as he described the Vita as, more or less, a portable home console. Koller: "Almost across the board, the Vita owner has been a PS3 owner." Of the Vita cynics, he says, "we knew better. We knew there was a market. Our research pointed over the last four years of creating it that there was a market. We still absolutely believe that. "Right now we're on forecast to where we thought the platform would be." He says that a lot of PS3 owners who don't yet have a Vita say they're simply waiting for a big enough game on Vita to convince them to make the plunge. That's why, despite a lack of huge Sony-made Vita games this fall (there's no Vita-exclusive God of War, for example), Koller thinks that the original game Assassin's Creed: Liberation or the promised Call of Duty: Black Ops II spin-off will trigger those hold-out PS3 owners to buy Vita. "They're waiting for the content that matters most to them," he said. "It's not a pricing issue. It's not as much about value; it's about let me get the content I want." There's guy names Ben Cousins who works for ngmoco and advocates for free games, mobile games and the overall idea that $60 games and dedicated consoles may soon be as archaic and marginalized as the arcade cabinets that used to define video gaming in the early 80's. A couple of weeks ago, when the Vita game Resistance: Burning Skies was released, he Tweeted a comparison between its Metacritic score and price to that of N.O.V.A. 3, a sci-fi first-person shooter for iPhones and iPads that scored in the 80s to Resistance's 50s yet cost about $7 compared to Resistance's $40. Graphically, the two games are not far apart; in most other ways they are. That cherry-picked evidence supports an argument that the Vita way of gaming, the $40-per-game way of gaming might be on its way out. Koller disagrees. "I don't think there is an issue vis a vis $40 games," he said. "I would argue there's an issue when you have a $40 game that doesn't have the right kind of experience. You have to have the experience that backs up that price point and on a platform-wide level we think—we've seen—there is an absolute demand for $30 and $40 games. Uncharted is $49 and it's [sold to Vita owners] incredibly well. I think that proves that if you have the right game and the right content and franchises, you can price the way you need to, and, by the way, once you get them in, you can start selling them the $5 to $10 games that you have on the Network." That, he added, "is what we're showing here and what we're planning to do." The impression I got throughout my Vita chat with Koller is that Sony is very interested in selling lots of downloadable games to Vita owners. They're popular, he kept saying, and so Sony may ramp up development. The smaller Escape Plans of the world, games that go for just $15, click with people, as does the back-catalog. Not surprisingly, Koller and co. have high hopes for the pending sale of PS1 games like Final Fantasy VII and Tomb Raider on the machine. Koller: "I don't think there is an issue vis a vis $40 games. I would argue there's an issue when you have a $40 game that doesn't have the right kind of experience." Sony has a weird message with the Vita, though. Koller himself says that Sony's approach with PSP had a flaw in that they initially tried to sell gamers PSP games that were too similar to console games. "Ports tended to be very difficult to message," he said. "Consumers go, 'I've got it on console. Why do I need it on this and spend $40 on this and spend $40 for exactly what I have on console? That doesn't make any sense.' I think that's a very relevant position." Relevant position that it may be, Sony and its partners are now pushing the idea that you can get copies of Street Fighter X Tekken and Sly Cooper: Thieves in Time on Vita that are so similar to their PS3 counterparts that you can share content or even, in the case of Sly one save file between the PS3 and Vita versions of the games. The games are, more or less, identical. In the case of Sly, Koller said, there will be some sort of offer that means that if you want the game on both devices you'll at least get a discount (maybe even get one for free; he didn't specify, details TBD, etc.). Koller also said that Vita games should emphasize what they can do on that machine that doesn't happen on other portable devices. "This is something we've been driving to the development community, ensuring that touch, motion, mutliplayer—those kinds of things that are ingrained into what you could envision from other platforms—comes to Vita and comes in a unique way. Something we're excited about is Call of Duty, which is going to be a rich multiplayer experience. You don't find that on a lot of handhelds; you don't find what we're going to have on Call of Duty at all on handhelds." Koller never said the Vita was for the iPad gamer, the iPhone gamer, the Facebook gamer, the 3DS gamer nor the Android gamer. It was clear to me, as we wrapped up, that Sony is targeting one key audience for the Vita: those of you who have a PS3. "Let there be no mistake," he said. "This is console gaming on the go. And that's what almost every consumer has said when they come in: I need to see a game that to me makes me feel as if this is a console game on the go. And that is really how it will be sold as we go forward."